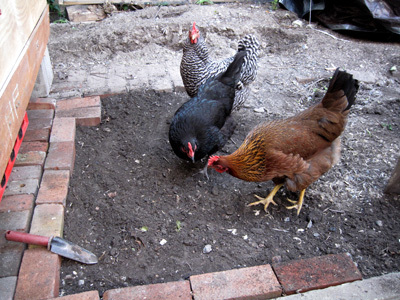 My chickens are such Brooklyn girls, even when they were pullets, loud noises or the sound of construction going on a few inches away from them didn’t bother them and even now sirens don’t even make them twitch. Construction of any sort intrigues them, they love sitting and watching the process or stand around and inspect the action at close quarters. 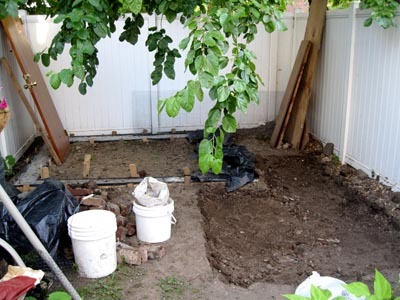 So of course when I was leveling off the brickwork for the new run foundation, which of course in my life means, a temporary structure til it is moved again, they had to come join in and survey it. When positioning the larger pieces of the run this evening, they were literally underfoot hugging themselves close to the chicken wire, to see what was happening, floating like feathery airships in between the component panels, a possibly lethally tight squeeze, making sure everything was up to scratch in their minds. I am wondering how I will be able to keep them away from the construction workers who will be building the landlords balcony a few weeks from now. The chickens must have been giving me some, we are unhappy mental vibes this morning, as I woke with a start, in the wee wee hours of dawn. I went into the kitchen as a great big hullabaloo started in the moved coop. They were all screeching and crying full voice as if they were all laying at once or being attacked by something. I grabbed appropriate garb and rushed out to unlock the coops front door to let them out. Half of them were still asleep on their perches, crying, sleepy eyed and all, it was really early even for them. Dazzle jumped out and escaped as fast as she could, while the others just stood on their perches and voiced their grievances at me. Hepatia hopped on the newly opened window feature. This was a dangerous move as the window juts into the coop at an awkward angle and once on it from the highest perch it is a daredevil descent onto the coop floor, with nowhere safe to land with wings outstretched. The coop is now up on cinder blocks and pallets compared to its previously low level, so there is no firm landing spot out the door either, for an infrequent flyer like Hepatia. She just sidled to the edge of the window pane, looked down, looked at me as dignified, imposingly and aggravated as she could manage, while she was hunched down trying not to hit her head on the slanted roof, and honked some more. As I tried to grab her, she gave a quick retreat backward but realized that was not going to be possible. She still managed to vocalize ear-splittingly in the confined space and to bat me around the face with her wings a few times as I rescued her from damaging herself. All this fuss is because the runs inside door is not open. The heat in the coop is tremendous, as it is in my flat. 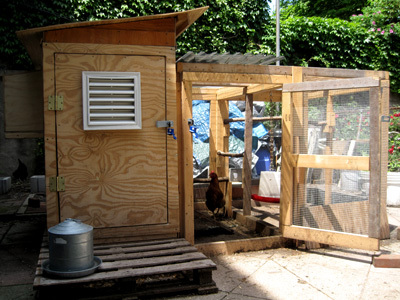 The chickens are used to being their own birds and escape through the side hatch into the run, no hatch equals no freedom for them to roam in a larger more temperate space. They are not amused. 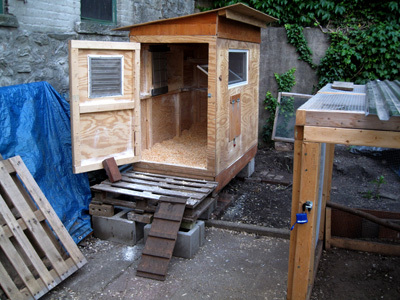 Memorial Day Coop Move Stage One Complete – Amidst the heat and humidity. A move of only a few feet away and lots of chicken nervousness about the new placement, even though they all wanted to help move it. Considering I designed and built it on the fly in 3 days in sub zero (degrees C) temperatures it came apart and was put together easily, phew! MUD's Brooklyn Chicken Eggs Brunch #2, for Memorial Day. Even though there was a coop move going on I had to make some brunch with my Brooklyn chickens eggs as they desperately screeched all day trying to find alternative nesting sites to lay their eggs. It is surprising how long they can hold off laying an egg. Now I know why they kick up a fuss and try to get my attention some days, they want me to give them another nest box. 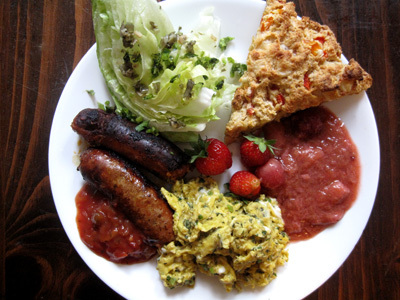 Festive Brunch: Scrambled Eggs with Lemon Balm and Oregano from the Garden, Iceberg Lettuce with Herb Vinaigrette, Mango Chutney, Hot Italian Sausages, Strawberry, Rhubarb and Cherry Compote, Double Pepper, Parmesan and Cheddar, Buttermilk Biscuits with a few Strawberries picked fresh from the front garden. 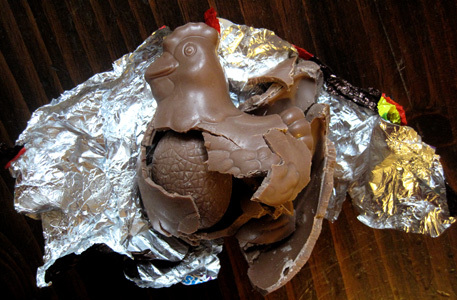 Chocolate Hen with Chocolate Egg Inside, from the UK.